Mansfield and Lauterbur were awarded the Nobel Prize in Medicine for inventing the MRI scanner in 2003. 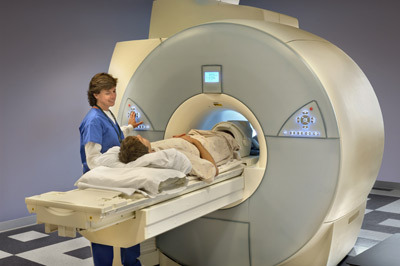 MRI, or magnetic resonance imaging, uses strong magnetic fields to change the spin of atoms in our bodies. This creates tiny changes that MRI computers process this to construct images. In 1973, Paul Lauterbur showed NMR could produce images from which he could slowly build a picture of the inside of a body. 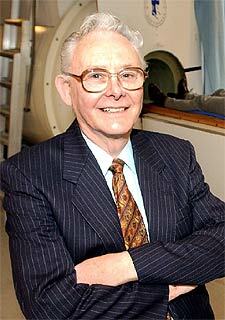 British scientist Peter Mansfield developed the mathematical processes that turned MRI into a useful rapid imaging technique. Sir Peter’s early work was in Nuclear Magnetic Resonance (NMR), then being used to study the chemical structure of substances. He joined the Department of Physics, University of Nottingham, in 1964, and by the early 1970s was working on the application of NMR to imaging that led directly to Magnetic Resonance Imaging (MRI). In 1973 Peter showed how the radio signals from MRI could be mathematically analysed, making possible their interpretation into useful images. He suggested gradients as a way to spatially localise NMR signals in a paper published in 1973. His method would speed up the process of producing images from an hour to a fraction of a second. A medical diagnostic application was further progressed by the development of a rapid imaging technique called echo-planar imaging making 3D imaging feasible. The first MRI scan of a human body part was made by Sir Peter Mansfield, of a cross-section of the finger of his research student Dr Andrew Maudsley, complete with bone, bone-marrow, nerves and arteries. The images were presented at a special meeting of the Medical Research Council in 1976. American doctor and scientist Raymond Damadian built a partial body MRI scanner in 1977, which he called the ‘Indomitable’.